This holiday season, don’t worry about finding the perfect gift, because we have it at Teddy’s Bigger Burgers! 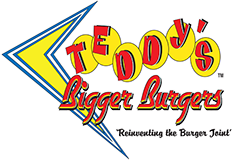 We are pleased to announce our Teddy’s Bigger Burgers Gift Cards, a great gift and stocking stuffer! It’s the gift that gives back! When you purchase a $50 Gift Card, you’ll also receive a FREE Teddy’s Bigger Burgers Logo T-Shirt! And when you purchase a $25 Gift Card, you’ll receive a $5 Burger Bucks certificate! Instant gratification for you and your loved ones this holiday season with the Gift of Teddy’s!